Pomegranate nutrition that will rev your energy levels through the roof! Pomegranate Nutrition Packed with Tons of Antioxidants! 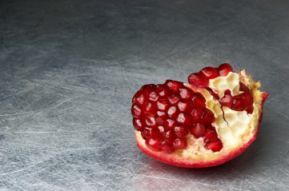 When looking to get the most out of pomegranate nutrition, you may want to consider incorporating this fruit into a delicious pomegranate smoothie. It is said that the flavor of this fruit is similar to the taste of cranberries so it can be a tart taste. This is one reason why it makes sense to add it into a smoothie. This way you can get the full benefits of pomegranate while you sweeten the taste. There really are too many benefits of pomegranate nutrition for you to pass up a chance to incorporate it into your diet. Many people are not aware of the benefits so they miss all the great nutrition and antioxidants. One of the most attractive factors of the fruit is that it has outstanding antioxidant properties. Most people are aware that other fruits such as blueberries and oranges are high in antioxidants. The antioxidant levels of pomegranates beat the other fruits hands down. By adding antioxidants to your daily routine you are helping to protect your body against the damaging effects of the free radicals that we come in contact with all the time. How do you eat a pomegranate? There are many way to take this delectable fruit apart. To cut a pomegranate, you’ll need a sharp knife, a bowl of water, and of course the pomegranate. Do be careful not to squirt any juice onto your clothes. Pomegranate stains are hard to get out! 1. One of the easiest ways is to take a knife and cut off both the bottom and the top of the orange shaped fruit. 2. Then, make a several shallow slices down the side of the fruit from top to bottom. 3. Once you have done this, use a bowl of water to help separate the meaty seeds from the veins (pith) of the fruit. You can break the entire thing apart in the water as you will find that the seeds sink to the bottom and the white pith will float up to the top of the water. There is a variety of ways to buy pomegranates. You can buy them fresh, frozen, juiced, and powdered. I prefer frozen and powdered over the other options. Frozen and powdered are more convenient than having to pull apart a fresh pomegranate. Also, frozen and powdered usually contain more nutrients than the store bought juice. The ultimate best way to get pomegranate nutrition is from fruit right off the tree. If you have the right climate, try growing your own pomegranate tree! 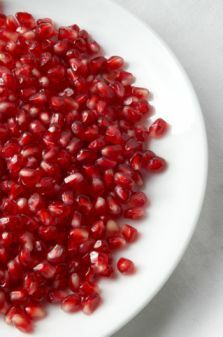 To get frozen pomegranate kernels, look in your frozen “health” section in your grocery store. It will probably not be at Wal-mart. So, look at your local stores. To get dried, powdered pomegranate, check out your local health food store. They probably sell a mixture of different high antioxidant fruits in one container. One place I like to shop is iherb.com. They are one of the most inexpensive and comprehensive health-oriented websites that I know. Freezing the kernels are the best way to preserve fresh pomegranates. They can frozen to be used at any time over a 3 month period. This makes it a simple way to store and to enjoy the pomegranate benefits whenever you want. Can’t get your kids to eat the pomegranate kernels? This is where smoothies can come into play. People of all ages love smoothies. You can add fresh, frozen, juiced, or powdered pomegranates easily into any smoothie. Your family will not know the difference. Check out my pomegranate recipes for smoothies. Smoothies are the perfect way to get in the pomegranate nutrition that your family will benefit greatly from. Make a round of smoothies for the whole family and stay healthy.